Home / Clock Projects / Lyre Wall Clock Woodworking Plan. 04-FS-145 - Lyre Wall Clock Woodworking Plan. Our Lyre Wall Clock is based on classic 200 year old designs. The Lyre Clock derives its name from the stringed musical instrument in the harp family. A quartz or mechanical movement with a pendulum about 16 inches long can be easily installed. Several options for the detailed rectangular box are included. The detail pieces can be cut on a band or scroll saw. Build in furniture grade woods such as mahogany, walnut or cherry. Woodworking patterns distributed and produced by WoodworkersWorkshop®. This independent designer offers full size drawings on 17x11 inch sheets of paper. All measurements are in inches. Having said that, ALWAYS refer to the measurements for accuracy. Proven designs, fully detailed instructions and painting guides provided. Not all parts are full size given the limitation of the paper it is printed on. If you have any questions concerning this, contact us first. This plan is not available as a download. 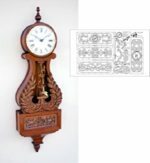 Halifax Bracket Clock Vintage Woodworking Plan. This is a vintage woodworking plan. This is a vintage woodworking plan to build a mantle or wall mount clock.